Electronics Costs > How Much Does a SD Memory Card Cost? How Much Does a SD Memory Card Cost? An SD card, or secure digital memory card, is a type of storage device used in most portable devices. SD memory cards are primarily used for digital cameras and mobile phones, and these memory cards come in different sizes, usually one gigabyte and higher. The price of the SD memory card depends on the size of the card and where you purchase one from. There are three standard sizes of memory cards: a standard, mini SD and Micro SD. 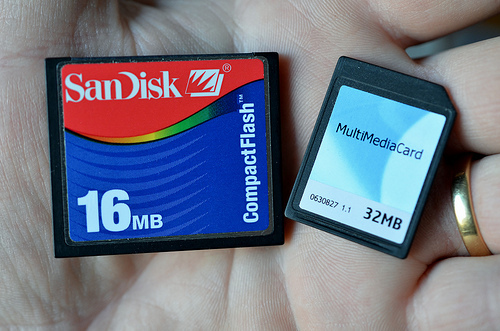 On average, these memory cards are going to cost anywhere from $5 to $35; again, depending on the size. The SD and SDHC, which tend to be the most common and the cheapest, will cost anywhere from $2 to more than $15, depending on the capacity and the brand. These memory cards will be the size of a postage stamp and will commonly be inserted into devices such as cameras or other devices that require expandable storage. At Micro Center, for instance, most of its SD cards retail for about $6 to $45. Another type — the high-performance SD cards — are designed for casual camera users who don’t care about fast speeds. These type of cards can range anywhere from $5 to $15. Micro SD, SDHC and SSDX cards, which are commonly found in most mobile phones, will be about 75 percent smaller than the standard SD. Even though these cards are smaller, they can still be used in standard SD slots if you use a special adapter, an adapter that most micro SD cards come with. These cards, along with the adapter, often cost anywhere from $3 for a 2-gigabyte card to as much as $20 for 32 gigabytes. Lastly, a newer SD card, referred to as an SDXD, will have a greater capacity than the cards mentioned prior and can cost as much as $50 for close to one terabyte. One of the largest MicroSD cards — a 1 terabyte — can retail for close to $100. Memory cards will be categorized by the speed, referred to as class, and this “class” can determine how fast the cards can upload photo and video. Common capacities that come with these types include two, four, eight, 16, 32, 64, 128 and 256 gigabytes. An SD memory card reader is an external tool that can hook up to any USB port. The card can simply be placed within the device, allowing the card to be read on any computer. These readers, if necessary, can cost anywhere from $9 to $20. For those who have more than one SD card, cases or a holder may be necessary to not only protect the cards but to organize them as well. If you’re unsure which SD card you need to use, refer to this guide or simply search for your product description to see which one will fit. Also, just because a device may not be compatible, it doesn’t mean there won’t be any workarounds. For example, people often search for 64 gigabyte SD cards for their Nintendo 3DS. While this card won’t work if you simply insert it, there are ways to format it so it does. Micro SD cards are sold together with adapters, which allow smaller SD cards to be inserted into regular size SD card slots, making the SD cards more flexible since different devices have different SD card slots. Newer SD cards can insert into any computer USB port, allowing you to read all the files on the card with ease. Consider going with no name brands. Don’t just purchase the memory card based on the name brand alone as many no-names have just as good of a reputation and can cost much less. Memory card deals can commonly be online via Slickdeals and even through simple sales at popular retailers such as Best Buy and Walmart.